Buyers continue to take their time to finalize property transactions as we continue through the spring market. 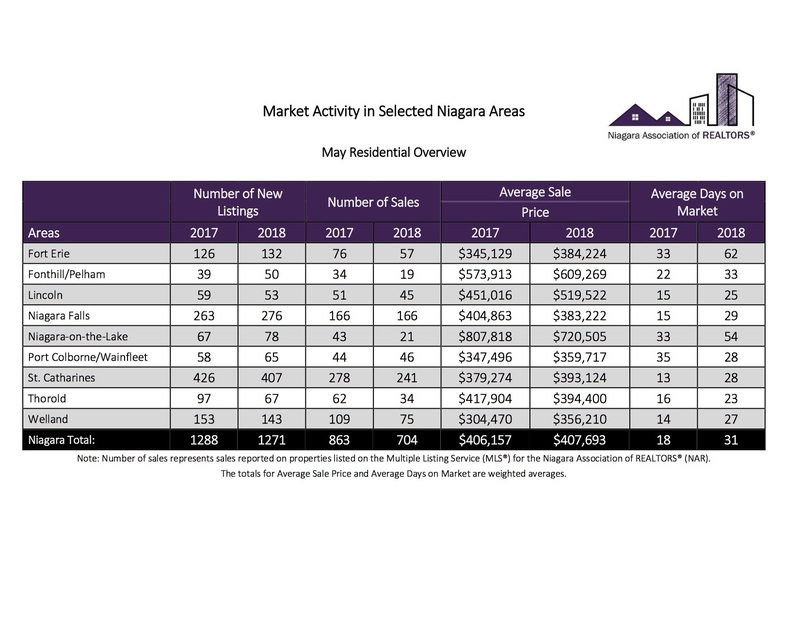 The Niagara Association of REALTORS® (NAR) reported 768 property sales processed through the NAR Multiple Listing Service (MLS®) system in May. This represents an 18.6% decrease in sales compared to May of last year. The average days on market increased 72.2% from 18 to 31 in the residential freehold market and increased 94.4% from 18 to 35 in the condominium market. The residential average sale price of $407,693 had a marginal increase of 0.38% versus last May while the number of residential property listings continue at an expected pace of 1,271 versus 1,288 in May 2017. The list price to sell price ratio is 98.1% v.s. 100.9% in May 2017. Year to date, residential property transactions total 2,620 v.s. 3,497 in May 2017. This represents a decrease of 25.1%. The year to date residential average price however increased 2.4% versus a year ago. The dollar value of all homes sold in May of 288.6 million fell 17.7% from the same month a year ago. Active residential listings of 2,288 by the end of May is 51.8% higher than this time last year. The sales to new listings ratio is 55.4% for residential properties. “The story with these numbers is that our region continues to find balance vs the fast-paced market of 2017. While the percentages are significant vs a year ago, we need to bear in mind the remarkable activity that 2017 delivered,” said Stephen Oliver, President of the Niagara Association of REALTORS®.